Amano was born in Hirosake, Aomori Prefecture in 1929, and graduated from Aomori Prefecural Technical School. 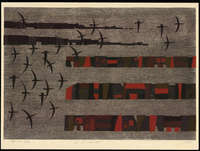 He taught himself woodblock print making and first exhibited his prints in 1955 with the Nihon Hanga Kyokai. 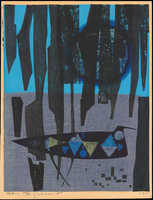 In his early prints he often used strong woodggrain as an element, and is best known for his images of fantastic birds or fish (as seen below). 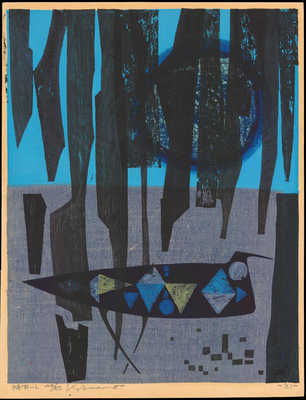 As his technique matured his prints became more abstract in design.